The witnesses -- "John Doe No. 1" and "John Doe No. 2" -- fear retaliatory "violence"
Affidavits say founder Erik Prince "views himself as a Christian crusader"
(CNN) -- Two former Blackwater employees have made statements against Blackwater Worldwide and its founder Erik Prince, accusing the security company and its former CEO of murder and other serious crimes in Iraq, according to court documents filed this week. 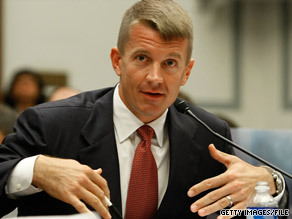 Blackwater founder Erik Prince, shown here before a congressional panel in 2007, recently left the company. The sworn affidavits by an ex-Marine who joined Blackwater and another employee -- listed in the documents as "John Doe No. 1" and "John Doe No. 2" -- are part of a civil lawsuit in U.S. District Court in Virginia against Prince on behalf of Iraqi families who say they lost loved ones at the hands of his company. Blackwater, recently renamed Xe, issued a statement Tuesday, saying it would respond "to the anonymous unsubstantiated and offensive assertions put forward by the plaintiffs," in a brief to be filed August 17. The company had a security contract for operations in Iraq under the U.S. State Department until May, when the federal government declined to renew the contract. The decision did not affect other contracts Blackwater has with the State Department, a senior State department official told CNN earlier this year. Several of the plaintiffs are connected to a September 2007 shooting incident in Baghdad in which the Iraqi government says security guards, then employed by Blackwater, fired upon and killed 17 Iraqi civilians. The affidavits by the two witnesses, who did not want to be identified in the court documents filed Monday for fear of retaliatory "violence," paint a menacing portrait of Prince, who recently resigned from his company. "First, he views himself as a Christian crusader tasked with eliminating Muslims and the Islamic faith from the globe. ... Second, Mr. Prince is motivated by greed," says John Doe No. 2. "He sought every opportunity to deploy men to Iraq in order to earn more money from the United States government." He refers to another incident when he "first arrived in Baghdad" in which he saw fellow employees pulling weapons out of a shipment of dog food -- the allegation being smuggling. John Doe No. 1 describes witnessing one incident in Baquba, where a Blackwater employee allegedly fired into a passing single-passenger vehicle without provocation. He says he's heard of similar instances of excessive or deadly force from other Blackwater employees. However, neither gives clear details about the incidents they describe, such as specific dates or locations. The court documents filed Tuesday are in response to a defense motion to dismiss the suit. The suit says the affidavits were also submitted to the Justice Department, which is engaged in an ongoing investigation into the Blackwater case. No criminal charges have been filed against Prince. "It is obvious that Plaintiffs have chosen to slander Mr. Prince rather than raise legal arguments or actual facts that will be considered by a court of law. We are happy to engage them there," the company statement said. "We question the judgment of anyone who relies upon and [reiterates] anonymous declarations." Earlier this year, five former Blackwater security guards pleaded not guilty to federal charges of manslaughter and other serious crimes stemming from a September 16, 2007, shooting. Their trial is set for February 2010.